This connection involves a HD Satellite TV box, HDTV, DVD/VCR Combo unit and Audio/Video Receiver. o Audio/Video RCA cables (1-yellow, 1-red & 1-white audio). A Satellite TV provider is used to receive TV signals. 1. Connect a HDMI cable from satellite box to HDTV. This is for watching HDTV. 2. Connect RCA video and audio cables from satellite box composite output to DVD/VCR composite Line input. This is for recording TV shows. 3. Connect HDMI cable from DVD/VCR HDMI Output to HDTV HDMI input. Note: if DVD/VCR combo unit does not have HDMI output, then use the component video output. 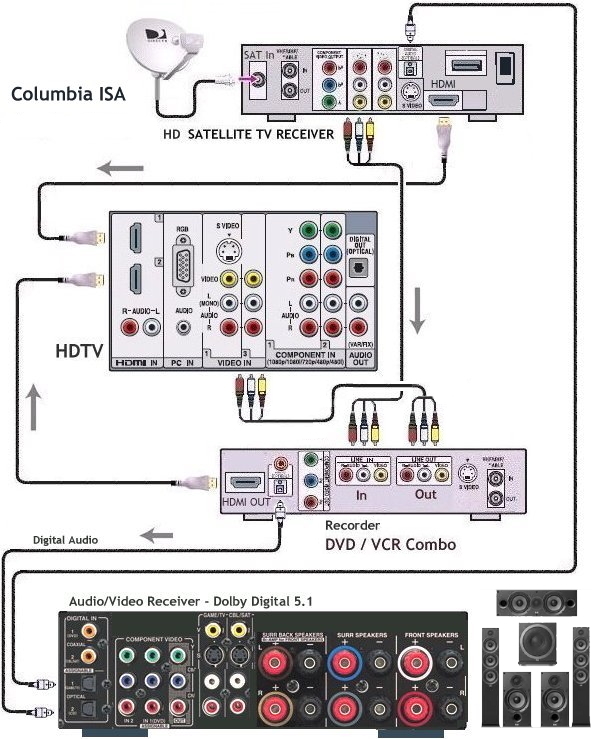 Connect green, blue, red RCA cables to HDTV green, blue, red inputs and also connect white and red analog audio cables from combo unit to HDTV analog audio inputs (white and red). 4. Connect Optical cable from Satellite box digital audio optical output to Receiver's Optical digital audio input. This allows 5.1 surround sound bitstream to A/V receiver for processing and output to loudspeakers. Note: Some TV shows do not provide 5.1 surround sound. 5. Connect Optical cable from DVD unit digital audio optical output to Receiver's alternate optical digital audio input. This allows 5.1 surround sound bitstream from DVD-Video to A/V receiver for processing and output to loudspeakers. o To view TV shows. o To record TV shows to DVD/VHS recorder. o Play recordings to TV. o Play DVD-Video to HDTV. o Listen to surround sound. The TV, DVD/VHS recorder will need to be set to the proper input depending on your source. Select proper input source on the TV to watch DVD/VHS or satellite TV. Select proper input source on DVD/VCR to record TV. The input sources can be selected usually by using the remote control buttons for the respective devices. Buttons such as LINE or VIDEO or AUX or INPUT SELECT or an actual channel such as 93 or 00 or 99 depending on your brand. Consult owner's manual here. TV Channels are selected on the satellite converter box using the remote control for the box. The satellite converter box will output on the 3 RCA cables audio/video line output. The DVD/VCR outputs on line output using HDMI cable.